SOLDEU, Andorra — Mikaela Shiffrin added yet another trophy to her record-breaking season at the World Cup Finals on Thursday. Unlike most of her other recent victories and titles, though, this one was unexpected. Shiffrin won the World Cup super-G season title for her 10th career crystal globe — but first in a speed discipline. "It's special because I really never thought I could be in this position this season already in super-G," said Shiffrin, who had not won a race in the discipline before this campaign. "The way that everybody came together and made this work was just amazing," Shiffrin said, paying tribute to her coaches. "We are all so proud and everybody feels some ownership of this." Shiffrin finished fourth in the season-ending race, which was won by Viktoria Rebensburg of Germany. She has also won three overall titles and six slalom titles, and is a strong favorite to add the giant slalom season prize on Sunday. Thursday's result moved Shiffrin past the 2,000-point mark in the overall standings, making her only the second skier to achieve the feat in the 53-year history of the World Cup after Tina Maze did it in 2013. With two races left this weekend, Shiffrin has 2,004 points and cannot break the Slovenian standout's record of 2,414 — but that has never been a goal of Shiffrin's, who skipped various events this season. In fact, remarks by Maze back in 2013 have played a role in Shiffrin's decision not to enter all races. 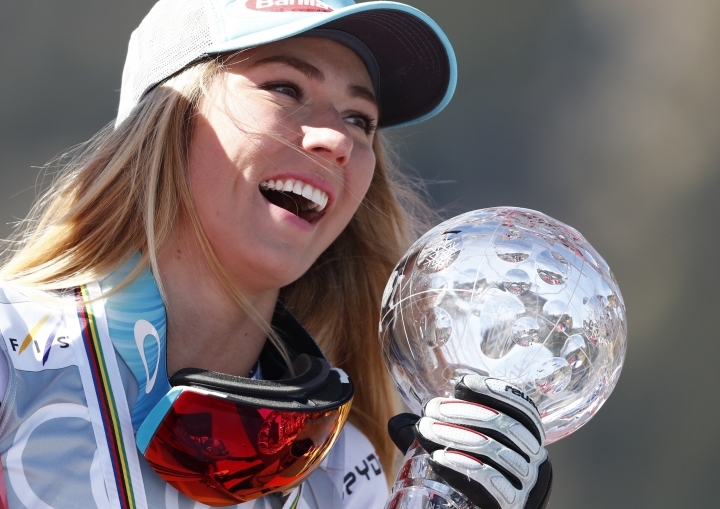 Shiffrin recalled how Maze came up to her after she had edged the Slovenian to the slalom title in the last race of the 2012-13 season, in which Maze had competed in each and every World Cup event. "She congratulated me and she basically said, 'Don't do everything. It's so exhausting. I've completely lost my passion.' She looked at me dead straight in the eyes and we'd had spoken a little bit before that, but up until that point, we were direct competitors competing for the slalom globe," Shiffrin said. "It has stuck with me, almost haunted me, to the point where I'm like, yeah, I want to be able to race in everything. I want to be able to win in everything. But not to the point where I'm going to lose my passion. The schedule is so grueling and racing day in and day out and especially for somebody who's maybe more of an introverted personality. I don't necessarily draw strength racing or from being in that spotlight during races. That can be really tough. I totally saw it in her eyes." Shiffrin took it as warning. To the surprise of skiing greats like Lindsey Vonn and Bode Miller, she skipped the downhill and combined events at the world championships after winning gold in super-G. Even entering the super-G race at this year's World Cup Finals was not obvious to her, despite leading the standings after triumphing in all three previous World Cup super-Gs she competed in this campaign. A week ago, Shiffrin posted a photo on Instagram of her carrying her super-G skis, and saying, "Yes, these are my super-G skis, which can only mean one thing...take a guess??" Shiffrin's title chase got a boost because several races she had not entered were canceled, most notably last week in Sochi, where two super-Gs were called off because of bad weather. 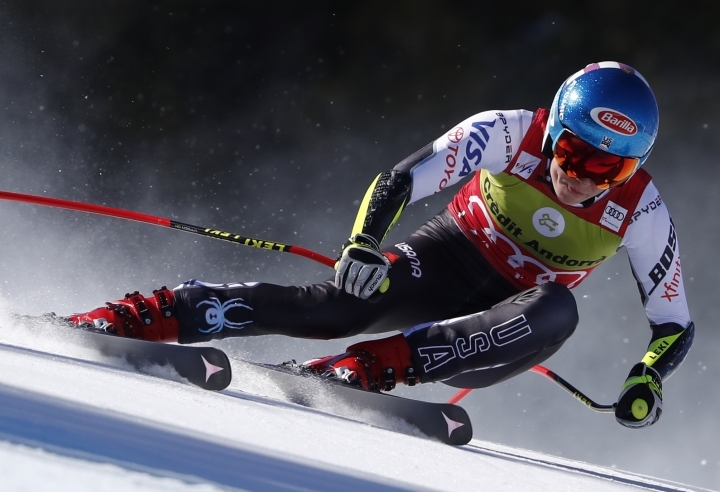 Shiffrin, who locked up the overall and the slalom titles weeks ago, is the first woman since Maze six years ago to win discipline titles in a technical and a speed event in the same season. "I've dreamed about someday, maybe, being able to win a globe in super-G but I really wasn't expecting it this season," said Shiffrin, who turned 24 on Wednesday. Shiffrin started the race with a 36-point lead over Tina Weirather of Liechtenstein, who won the super-G title the last two seasons. Weirather posted the fastest split times but skied out halfway down her run. Rebensburg beat Tamara Tippler of Austria by 0.15 seconds to win the race, with Federica Brignone of Italy 0.34 behind in third. Shiffrin shared fourth with Nicole Schmidhofer of Austria, 0.44 behind. Schmidhofer finished runner-up in the standings, trailing the American by 47 points. The women used the same course as the one for the men's race though some gates were set differently. Dominik Paris secured the men's title by winning the season-ending race. Both Shiffrin and Paris won super-G titles at the world championships five weeks ago, but had not won the season-long World Cup prize in the discipline before. Paris won his second race in as many days after also triumphing in Wednesday's downhill for his 16th career victory and first crystal globe. 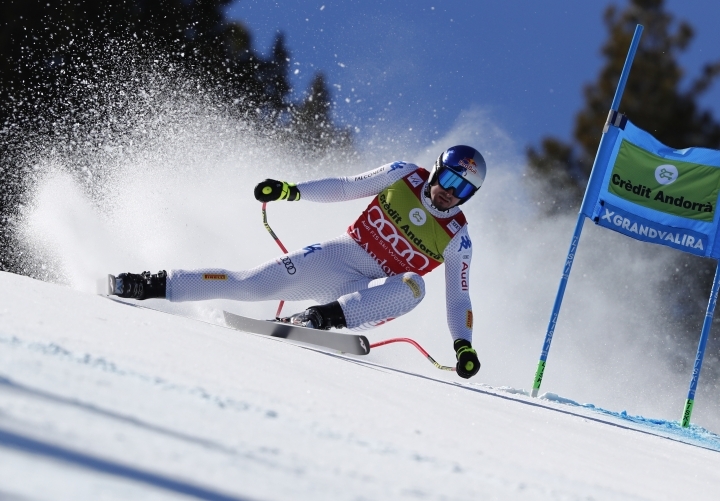 He extended his lead in the final standings to 84 points over Vincent Kriechmayr of Austria, ending a seven-year reign by Norway, which swept all super-G titles since 2012. "It's a dream come true. It's a lot of hard work and I pushed always," Paris said. "I was two, three times very close to take this but today it was working. I am so happy." Paris beat Mauro Caviezel of Switzerland by 0.15 seconds to win the race. Kriechmayr was third, 0.44 behind. The World Cup Finals continue with the team event on Friday.